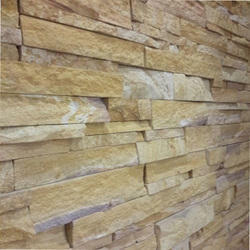 Leading Wholesaler of exterior stone cladding from Bengaluru. We are Passionately Engaged in Providing an Exclusive Array of Exterior Stone Cladding. Being lighter than stone, these reduce the load on the building and help you generate considerable savings. It is designed using finest raw material which makes it resistant to heat and moisture and enhances the durability and finishes of the product.